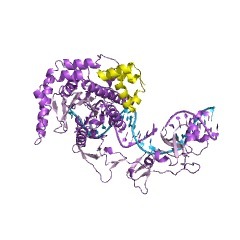 This short domain is found in the Rad4 protein. This domain binds to DNA. This short domain is found in the Rad4 protein. This domain binds to DNA [(PUBMED:17882165)]. There are 2099 BHD_2 domains in 2095 proteins in SMART's nrdb database. Taxonomic distribution of proteins containing BHD_2 domain. This tree includes only several representative species. The complete taxonomic breakdown of all proteins with BHD_2 domain is also avaliable. Click on the protein counts, or double click on taxonomic names to display all proteins containing BHD_2 domain in the selected taxonomic class. Recognition of DNA damage by the Rad4 nucleotide excision repair protein. Mutations in the nucleotide excision repair (NER) pathway can cause thexeroderma pigmentosum skin cancer predisposition syndrome. NER lesions arelimited to one DNA strand, but otherwise they are chemically andstructurally diverse, being caused by a wide variety of genotoxicchemicals and ultraviolet radiation. The xeroderma pigmentosum C (XPC)protein has a central role in initiating global-genome NER by recognizingthe lesion and recruiting downstream factors. 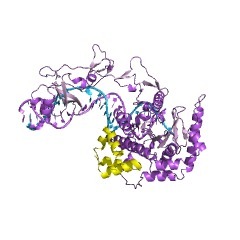 Here we present the crystalstructure of the yeast XPC orthologue Rad4 bound to DNA containing acyclobutane pyrimidine dimer (CPD) lesion. 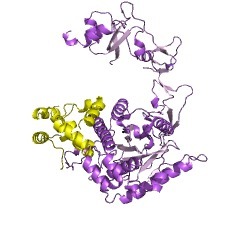 The structure shows that Rad4inserts a beta-hairpin through the DNA duplex, causing the two damagedbase pairs to flip out of the double helix. The expelled nucleotides ofthe undamaged strand are recognized by Rad4, whereas the two CPD-linkednucleotides become disordered. These findings indicate that the lesionsrecognized by Rad4/XPC thermodynamically destabilize the Watson-Crickdouble helix in a manner that facilitates the flipping-out of two basepairs.